Audemars Piguet creates some of the most elegant luxury watches in the world. The Swiss manufacturer's repertoire includes complicated models with perpetual calendars and tourbillons. The iconic Royal Oak is the brand's most famous model. Luxury watches from Audemars Piguet are some of the best the world has to offer. The manufacturer is considered one of the "Big Three" of the Swiss watch industry, alongside Patek Philippe and Vacheron Constantin. Extremely complicated functions, such as the perpetual calendar and minute repeater, feature in many Audemars Piguet models. These timepieces are characterized by perfect craftsmanship and excellent finishes. The Royal Oak is the Le Brassus-based brand's most famous model. Its arrival in 1972 turned the world of luxury watches on its head, as this distinct stainless steel piece cost just as much as a gold watch. At the time, its price came in at over 3,600 Swiss francs. This model established the luxury sports watch genre, which today includes the Patek Philippe Nautilus. In 2018, Audemars Piguet made watchmaking history once again with the Royal Oak RD#2 . It is the world's flattest automatic watch with a perpetual calendar. The case is only 6.3 mm thick, making it 2 mm flatter than that of the classic Royal Oak "Jumbo" Extra-Thin with two hands. The Royal Oak Offshore Tourbillon Chronograph is yet another highlight from AP, as fans tend to refer to the brand. Versions from 2018 with a skeletonized dial come in stainless steel or rose gold. They are especially rare, as each version is limited to 50 pieces. The power reserve of the in-house caliber 2947 is as impressive as the rest of this timepiece: It lasts seven days when fully wound. How much do Audemars Piguet watches cost? A stainless steel Audemars Piguet Royal Oak costs about 29,100 USD in mint condition. Pre-owned versions of this 39-mm wristwatch are only slightly less expensive at 27,700 USD. 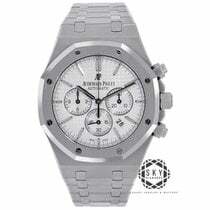 Prices for never-worn and pre-owned models have been rising steadily over the last few years, making the Royal Oak ref. 15202 an especially safe investment. This reference number comes the closest to the original model from 1972. Early examples from the 1970s are especially highly coveted among collectors. The first versions of the Royal Oak can be found under the reference number 5402. Prices for these watches come in at around 29,400. Prototypes in white gold are even rarer and therefore demand over 58,700 USD. If a 39-mm case is too small for you, you may enjoy the 41-mm Royal Oak Selfwinding. This larger version is markedly more affordable than its smaller sister model: You can find mint-condition models for only 18,300 USD and pre-owned pieces for as little as 16,800 USD. Even so, it also makes a great investment, as it has experienced rising prices in recent years as well. The Audemars Piguet Royal Oak collection also has something for fans of gold watches. These 39-mm pieces in 18-karat yellow gold cost 46,600 USD new. Pre-owned watches in very good condition are only marginally less expensive, making gold Royal Oaks a rather safe investment. Limited to 250 pieces, the Royal Oak in titanium and platinum sells for around 56,400 USD in mint condition. This model quickly increased in value after its introduction in early 2018. Lovers of rose gold watches should enjoy the Royal Oak Selfwinding ref. 15400OR. 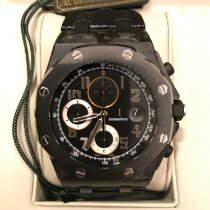 You can purchase this 41-mm luxury watch for about 43,400 USD new and 38,000 USD pre-owned. The chronograph is one of the most popular complications. The Royal Oak has also been available with a stopwatch function since the late 1990s. 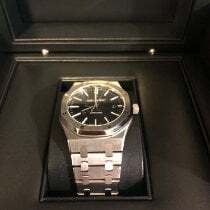 At around 23,600 USD, mint-condition stainless steel pieces are more affordable than the classic "Jumbo" with two hands. Pre-owned chronographs are slightly less expensive, costing around 22,900 USD. Variants in gold demand 50,500 USD new and about 45,300 USD pre-owned. The perpetual calendar is one of the most intricate and expensive complications. This is why prices for a never-worn Royal Oak Perpetual Calendar in stainless steel exceed 58,700 USD. Even pre-owned pieces demand an impressive 56,400 USD. Rose gold variants go for almost 82,200 USD new and 74,000 USD pre-owned. Versions in yellow gold are even more expensive. New pieces cost around 86,600 USD, while pre-owned ones change hands for 78,400 USD. The Audemars Piguet Royal Oak Grande Complication is one of AP's most complicated and expensive models. You'll need to have over 645,000 USD on hand to purchase one of these watches with minute repeater, a perpetual calendar, and a split-seconds chronograph. The Audemars Piguet Royal Oak Offshore represents an uncompromising and sporty evolution of the Royal Oak. It is perfect for anyone who finds the Royal Oak too small, flat, or modest. You can purchase a new chronograph model in stainless steel for about 21,100 USD. Pre-owned versions cost a few thousand dollars less. The reference number 26237ST is a special edition released in 2018 in celebration of the 25th anniversary of the Audemars Piguet Royal Oak Offshore. This timepiece looks similar to the first Offshore from 1993, which received the nickname "The Beast" thanks to its hefty design. Like the first model, this new version has a blue dial with a petite tapisserie pattern. The push-pieces and crown coated in blue rubber are yet another carryover from the original. Expect prices of around 35,200 USD for this timepiece. Offshore models in rose gold sit in a similar price range. Further horological highlights of this collection are watches with a perpetual calendar, chronograph, and minute repeater. A 44-mm Royal Oak Offshore Grande Complication in rose gold with a skeletonized movement demands a good 892,000 USD. Watches in the Audemars Piguet Royal Oak Concept series combine state-of-the-art technology with classic haute horlogerie. While their designs may be futuristic, these watches remain true to the typical porthole design of the Royal Oak. Top watches in this series feature a tourbillon and minute repeater. The Royal Oak Concept Supersonnerie costs over 563,000 USD in mint condition. A titanium Royal Oak Concept Tourbillon Chronograph goes for around 249,000 USD new. Fans of classic watches are sure to find what they're looking for with Audemars Piguet. The Jules Audemars collection includes round, gold watches. You can get an especially simple version with two hands for around 23,500 USD new and 20,300 USD pre-owned. The Jules Audemars Tourbillon Chronograph is the highlight of this series. This skeletonized watch in platinum sells for over 264,000 USD. The Jules Audemars Grande Complication in platinum is even more expensive at 704,000 USD. Watches in the Millenary collection are quite eye-catching thanks to their elliptical cases and decentralized dials. A mint-condition, 47-mm Millenary 4101 in stainless steel costs about 17,000 USD. Pre-owned pieces go for around 13,400 USD. The 18-karat rose gold model sits around 28,600 USD new and 19,600 USD pre-owned. Before Audemars Piguet released the Royal Oak in 1972, they were already producing classic wristwatches made of gold. These gold watches were especially thin or had intricate complications like a perpetual calendar. The legendary manual caliber 2003 was ultra-thin, with a thickness of only 1.64 mm. Audemars Piguet developed this movement together with LeCoultre in the 1940s. In 1993, Audemars Piguet expanded their sporty Royal Oak Offshore collection with a chronograph model. Compared to the first Royal Oak from the 1970s, the Offshore is a bit sportier and more masculine. Its bulkier design appeals above all to a younger audience. Famous wearers include basketball player LeBron James, rapper Jay-Z, and actor/politician Arnold Schwarzenegger . The Offshore is also available as a women's version set with diamonds. Diving watches with rotatable bezels are also available. The Offshore Diver is water resistant to 300 m (30 bar, 984 ft). Audemars Piguet also offers traditional wristwatches in addition to their sports models. The Jules Audemars line, named for one of the company's founders, contains elegant three-hand models with small or central seconds. However, there are also more intricate models with a chime, perpetual calendar, tourbillon, or minute repeater. The Grande Complication model is a true highlight in this collection. It features a perpetual calendar with a moon phase display, a chronograph function, and a minute repeater. There are also elegant, Extra-Thin models with two hands for the hours and minutes in the Jules Audemars collection. With a thickness of only 6.7 mm, these watches fit under every shirt cuff. Just as classic and elegant are the watches in the Edward Piguet line, named for the other founder. The series, which has been discontinued, contains many rectangular watches. Watches in the Millenary collection aren't just watches – they're gorgeous pieces of jewelry as well. The designs of these watches feature oval cases and decentralized dials, allowing a view of the movement. The calibers in this series are often skeletonized. Models in this series with a tourbillon and a diamond-set bezel, case, and dial, are true pieces of watchmaking art. Which Audemars Piguet Watch is Right for Me? The Royal Oak is the most famous watch from Audemars Piguet. The Swiss manufacturer first introduced the watch in 1972, and its look revolutionized the watch industry. 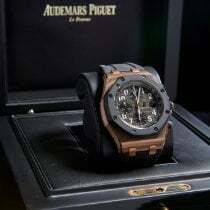 With the Royal Oak, Audemars Piguet ushered in a new era in luxury watches. Before then, stainless steel sports watches were not en vogue among the top luxury manufacturers. In the early 1970s, wristwatches from Patek Philippe, Jaeger-LeCoultre, and Vacheron Constantin were still predominantly made of gold and featured traditional designs. The history of the Royal Oak began in 1971. At this time, Georges Golay was the general director at Audemars Piguet. 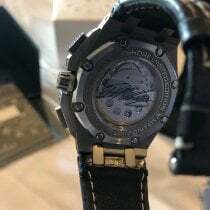 The Italian distributor for Audemars Piguet, Carlo de Marchi, approached Golay and requested a wristwatch that you could wear while driving a sports car, during a weekend on a boat, at a fancy dinner, and celebrating at the country club. Steel was not excluded as a possible material for the case and band. Gérald Genta , one of the most famous watch designers in the world, was commissioned by Audemars Piguet to design the Royal Oak. Four years later, Genta would design Patek Philippe's Nautilus. Thanks to the octagonal bezel, the Royal Oak's design is reminiscent of a ship's porthole . A characteristic feature of the Royal Oak is the set of eight hexagonal screws keeping the bezel screwed onto the case. In between the bezel and the case is a rubber seal. The slots in the screws are perfectly aligned, creating a harmonious circle. This is made possible by tightening the screws from below. The stainless steel bracelet is integrated into the case, and the links taper off the closer they get to the clasp. At the beginning of its career, the Royal Oak wasn't particularly successful. Today, however, it's the most successful and beloved watch from Audemars Piguet. Audemars Piguet introduced the Royal Oak Offshore in 1993. Its octagonal bezel makes the relation between it and its sibling, the Royal Oak (1972), very clear. However, the Offshore has an overall sportier look, partly due to its chronograph function. The diving models are water resistant to 300 m (30 bar, 984 ft), a feature that emphasizes its sporty nature. In comparison, the original Royal Oak is only water resistant to 50 m (5 bar, 164 ft). Currently, there are over 70 different Royal Oak Offshore models available, ranging from diamond-set ladies' watches to chronographs with tourbillons. Gold is used as a case material in this collection as well. The case diameter ranges from 37 mm for the women's models to 48 mm for the men's models. More moderately sized 42-mm watches are also available. The Grande Complication models are highlights in this collection. As the name suggests, these watches have multiple complications, such as a chronograph function, perpetual calendar, and minute repeater. The case has a diameter of 44 mm and a thickness of 15.7 mm. Due to the intricate complications, the watches are only water resistant to 20 m (2 bar, 66 ft). Thanks to the automatic winding mechanism, the timepieces automatically supply themselves with energy as you wear them. You have the choice between a titanium or white or pink gold case, and the strap is made of rubber. The watches in Audemars Piguet's Millenary collection have a characteristic oval case . Just as distinctive are the decentralized dials on the newer models, which offer a view of the caliber. Audemars Piguet decorates their movements very intricately, making them a pleasure to look at. The Millenary series was first introduced in 1995. There are currently many versions of the Millenary available. The case size ranges from 39.5 mm to 45 mm and all the way to 47 mm. Some models feature diamonds on the bezel, case, dial, and movement bridges. The highlights of this collection are watches including complications like a tourbillon, minute repeater, or semi-perpetual calendar. A semi-perpetual calendar only has to be manually corrected once every four years; it cannot account for February 29th in a leap year. Audemars Piguet has a history stretching back over 140 years. Jules-Louis Audemars founded the company in 1875 in Le Brassus, Switzerland, shortly after he completed his education as a repasseur (or inspector). A repasseur conducts the final inspection of a watch before it leaves the manufacturer. This position includes two further duties: correcting any mistakes and assembling the parts so that they function. Le Brassus is located in the Vallée de Joux, a Swiss valley home to many world-renowned watch manufacturers, such as Blancpain, Jaeger-LeCoultre, and Breguet. While building up the company, Jules-Louis Audemars received support from a childhood friend, Edward-Auguste Piguet, a fellow trained repasseur. In 1881, they founded the company Audemars Piguet & Cie. From the beginning, they produced complicated pocket watches. They began presenting watches with a perpetual calendar, minute repeater, and chronograph function only a few months after founding the company. Their "Grande Complication" pocket watch won a medal at the 1889 Exposition Universelle in Paris. Their next sensation came in 1891 when they released the smallest movement with a minute repeater to date. The diameter of the caliber was only 18 mm. Audemars Piguet has a long history of breaking with convention, introducing their first wristwatches towards the end of the 19th century, when pocket watches were still the norm.